Above is how my week shook out. It was technically a Hulk Mode week in that I did every work out on the right day for the right time! YAY ME! The week was what my Coach called a Race Simulation week. So the volume was a little light during the week and I had big workout on Sunday. Sunday was a Metric IM Brick. 112km on the bike followed by a 26.2 km run. 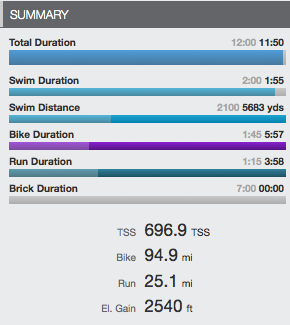 The goal was to use this to practice race day pace as well as my nutrition plan. My goal was to bike like I have been so far. All my long bike rides have been pretty easy effort wise. I haven’t been looking at HR data at all while riding. I wanted to fuel like I would on race day (eat every 45 min, S-Cap every hour, and drink well). My goal pace for the run was at least a 10:00/mile pace but I would be much happier with 9:30. I picked a loop that was 5.5 miles so I could circle back to my car easily for SAG support. I was super lucky and Stuart was able to run with me for the whole run (even though I am sure it was slow for him and his speedy legs!). The ride went well and I got off the bike feeling totally fine. I wasn’t tired at all! (Garmin data is here) Looking back at the numbers I was a little disappointed but more about that later. The run went great! I tried not to go out to fast because I do that often. After the first lap and seeing a lot of 9:00-9:15 miles I told Stuart we need to scale back a little on the second loop so we could finish the third loop strong. We were very conscious of the pace each mile and just kept running. I felt great until mile 15 and them I was getting a little tired. Not super tired; just a little bored with the loops and ready to be done. (Garmin data here). I was thrilled with the 9:14 pace! (full disclosure, my autopause was on). Now I once I saw the bike pace I was bummed. Only 16.6 MPH. I need around 17.5 MPH to get my 6:30 bike. BUT my run was amazing! I have been spending a lot of my time worrying about having this great bike split and the lesson really sunk in yesterday that not killing it on the bike is going to set me up for a really good run! That was exactly what I did during this brick. And I did it over a pretty decent distance. It was the biggest brick I have every done that is for sure! I am still feeling very confident about race day. My coach even said maybe I can go under 12 hours! I am not going to worry about that number until I get off the bike on race day. If I work too hard on the bike I am sure the run will fall apart. I really want a run I can be proud of. I am sure I will get passed a ton on the bike (I always do) but I have a feeling that I will pick up half of those who passed me on the run! ← Pick a Plan and Stick To It!